This is the 3rd Back seat organizer I owned but so far this is the best among the three. Aside from the Car organizer kick mat, it also came with 2 sun shades and a seat belt pillow. My other two organizer didn't come with two extra products. 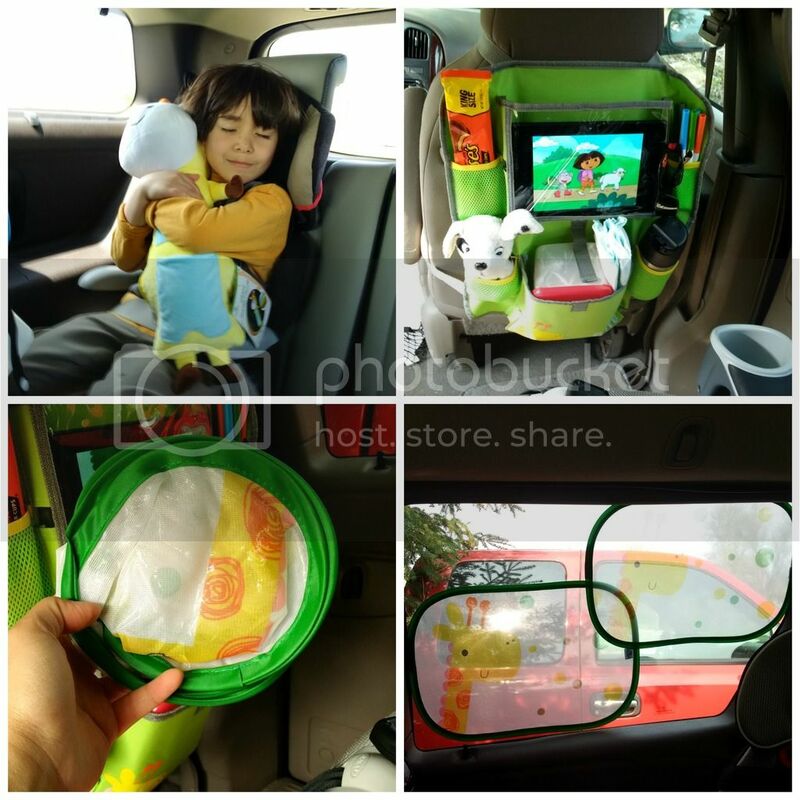 What makes it the best back car seat organizer for me is that, it is made from great quality materials, it is strong, doesn't rip and doesn't get wrinkly. My other two looks wrinkly after folding them. The color and the drawing on it captures my son's attention. He loves that all he needed is a hand reach away. Another thing I love about the organizer is that, there is an Ipad pocket and I am sure you can use it for something else too. In my case I put my Kindle HD fire in it and it fits so perfectly. There is a hole on the left side for the power cord just in case you want to keep it charging. I was able to put a lot of stuffs in the pockets, it holds the water bottle in place and even the diapers and wipe. Perfect protection for my brand new minivan seats since my son won't be able to leave shoe print. The second product that came with it is the sun shade which comes in two. I was amazed that I can fold it into round shape for easy storing but it's rectangular when it's open. It clings easily on the window using pick and stick static. Again, made from quality materials, colorful, and covers more space on the window. I used two just to show it but one should be enough for each window. The sun shades are about 18.5" x13" in size. Lastly, the seat belt pillow whom my son so love. It is soft, comfortable and huggable. it has pockets with zipper where he can store small toys or warm his hands inside. There are two additional pockets in front too. Perfect as nap pillow for long trips or neck protector from seat belt. It says it is machine washable but should be air dried. Measurement is 24". All of these products are so child friendly. Not only I love these products but my kids too. It will be very helpful for our coming trip this summer. I highly recommend it for those who have kids and travels a lot.